The Vickers Wellington was a British twin-engine, long range medium bomber designed in the mid-1930s at Brooklands in Weybridge, Surrey, by Vickers-Armstrongs' Chief Designer, R. K. Pierson in response to specification B.9/32. Issued in the middle of 1932 this called for a twin-engined day bomber of perceptibly higher performance than any previous designs. 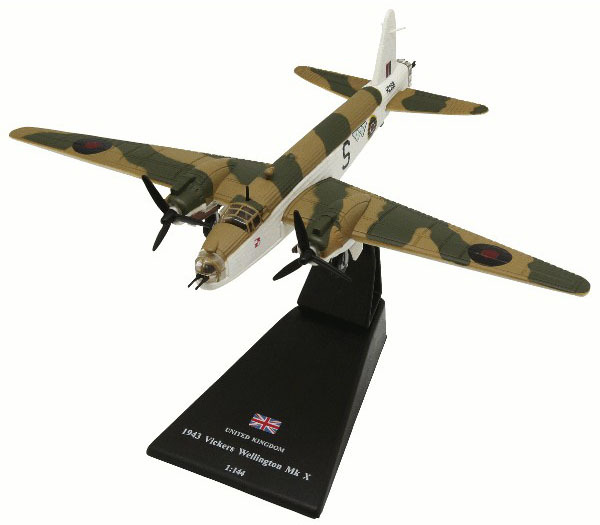 It was widely used as a night bomber in the early years of the Second World War, before being displaced as a bomber by the larger four-engine "heavies" such as the Avro Lancaster. The Wellington continued to serve throughout the war in other duties, particularly as an anti-submarine aircraft. It was the only British bomber to be produced for the entire duration of the war, and was still first-line equipment when the war ended. The Wellington was one of two bombers named after Arthur Wellesley, 1st Duke of Wellington, the other being the Vickers Wellesley. The most widely produced variant of which 3,804 were built. It was similar to the Mark III except for the 1,675 hp (1,250 kW) Hercules VI or XVI powerplant and a fuselage structure of light alloy, instead of steel. The Mark X was the basis for a number of Coastal Command versions. A total of 3,803 were built at Chester and Blackpool.